The D10 is back on Massdrop today. Has anyone had a chance to do measurements or any reviews on it? I only know of subjective reviews on it. Hooking it up, using my JDS Element as amp\volume control for this first run. I like the orange display, and it dims a bit after a few seconds of inactivity. Windows 10 provides a driver, and it runs fine at 44.1, but it seems if you want higher rates, you will need to download and install the drivers from Topping. FYI, I had to restart the PC and reinstall the D10 driver after the first installation attempt still showed an Unknown Device in Device Manager. Once it is installed and connected via USB, you will see a small TP icon in the system tray that will allow you to directly access the driver settings. Another pro-move....they provide the components and instructions needed for FooBar2K if you have not previously set it up for DSD decoding. Something I had not realized prior to purchase....like the JDS Labs Element, the DAC itself is powered by USB. What this means for SQ remains to be seen, I'm sure Amir will have things to say about that. All set up, ready to go. I have a few files from the 2L Nordic Sound Test Bench to play with (no, I've not invested one red penny in HiRes other than this DAC) so it's time to get listening. I've noticed that all these files have MQA encoding at some point, and I have grave concerns that MQA is a partially lossy format, and is therefore not suitable for audiophile usage when fully lossless (FLAC, OGG) is even more ubiquitous and is practically as bandwidth efficient. The one thing that sets this page apart is the multiplicity of formats, all of the identical recording, which makes for easier subjective A\B'ing. For the most part the DSD files sound fine, but several runs through present me with snap, crackle and cut-outs. After running through my suite of test tracks compiled from various sources, I'm convinced that, at least as far as the Topping D10 is concerned, the DSD formats offer nothing that my ears can hear. Now, as a DAC, the D10 is honestly excellent. Compared to the Element DAC(which I feel is a worthy bedside unit), the D10 easily bests it. It does have a slightly higher output than the on-board DAC, so some fiddling with the knob is needed to match levels. Subjectively , the overall clarity seems higher, and the bass also seems to dig just a bit deeper, but I'm fairly certain that subjective listening reports are about as useful as teats on a boar. Again, however, with my standard run of FLAC files, the D10 would occasionally stutter, crackle and cut out, which is annoying and puzzling. Again, however, with my standard run of FLAC files, the D10 would occasionally stutter, crackle and cut out, which is annoying and puzzling. Hmm, I haven't had any of the issues you describe, either on a Windows 7 desktop or an RPi with Moode 4.0, PCM or DSD. Perhaps try a different USB port? How about checking DPC latency? I'm super familiar with DPC Latency, since I'm using my ancient Dell Mini 910 (fanless, Atom 270) as a streamer for my 2channel system. That poor thing faints if you cut a loud fart. The new 9560 is my desktop rig and it is super fast for a laptop. I'm a nerd so even though it was brand-new, I re-did all the thermal paste, upped the RAM, swapped in a faster SSD and undervolted for better thermal performance. It shows zero indications of latency. It's possible that the dock is the issue, since Dell has eternally had the worst docks in the business, but the JDS has never suffered from the issue, so there is that. Also, I had not run the ASIO & SACD components on this PC before, so that might be causing issues. I really wish it was easier to flip FB2K over to another device. More subjective listening opinions...I must be a fan of the Sabre sound. The D10 is much brighter than the Element, but pleasantly so. Not splashy or sibilant, perhaps a bit more fatiguing, but also more....interesting. In the same vein, the bass seems boosted. If it were not for the subjectively proportional mids and upper mids, I'd say it sounds U-shaped, but I know that Topping just don't play that. They are going for dead flat, and I'd bet they achieve it. Long story short, this is a damn fine DAC, and it sounds sweet with the Element amp section. Just wanted to say thanks for reviewing this. I came here looking for information in this DAC (nº1 result in google for weeks). My old UCA202 is giving me lots of headaches in W10 and after years I decided is time for upgrade. Probably get on in Aliexpress today. Have you tried DSD256 native files or upsampled on DSD256? I don't have any upsampled files, to my knowledge. I have numerous DSD256 files in various frequencies, and I only keep them if I can have a corresponding PCM file from the same master. Otherwise A\B is just not possible. Hence my statement that I just cannot hear the difference on any of the signal chains I can cobble together. I can hear the difference in the various bits and bobs (not cables, I mean.... puhleeeze) sometimes, but the file format is just not doing it for me. Just for reference, I rip all my CD's to FLAC, then make a converted copy in MP3 VBR so my entire library will fit on a 256GB SD card for portable audio listening. I've tried my damnedest, but in nearly ever listening test, I cannot distinguish which is FLAC and which is a high quality MP3. Maybe that says something about me, or maybe it says something about formats, or maybe it says nothing at all. YMMV. Hope you enjoy it! I have other Sabre implementations, and this one is right up there with the best of them, maybe even better. I'm now wishing I had jumped on the DX7s Massdrop. Topping is really doing fine work. I do still have concerns about the fact that the DAC is USB powered, but I won't sweat it until Amir can make a few measurements. @amirm Hopefully you will have time to throw some USB ugliness at it when yours arrives and it gets to the test bench. Thanks! @amirm Hopefully you will have time to throw some USB ugliness at it when yours arrives and it gets to the test bench. Thanks! Will definitely test it and see what happens. Does the D10 mute the output when you switch from PCM to DSD or to different frequencies? I know that the D30 does it since they are advertising it, but I am not sure about the D10. Do you think there is a click when changing file frequencies? I observe it when I play a file with a different frequencies. Some DACs are muting the output when such a change happens so you do not hear anything. Other DACs don't do it and you hear an audible pop or crackling sound when it happens. This of course only happens if your player actively changes the output frequency to the DAC, or if you switch between PCM and DSD via DoP. Since the D30 does it I wondered if the D10 does the same. I finally ordered one unit, was waiting for early reviews, but i think it's a good option for a newbie like me! I am using a Xiaomi Mi HiFi Headphone now. 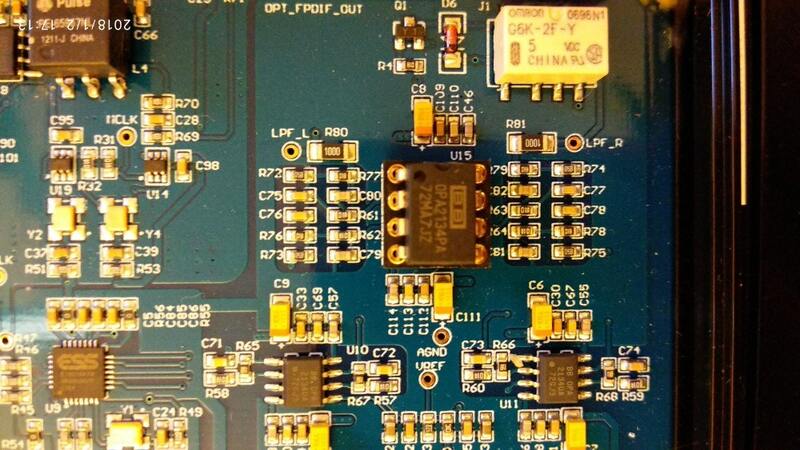 There is a muting relay (Omron G6K-2F-Y) near the outputs, so it's likely that is does. Nice, thanks for posting the link. Well right now the D10 sits in my basket. As soon as @amirm posts the review I'll pull the trigger .... or not. So nooo pressure. I've just set up a playlist in Foobar2000 with tracks at 16-44.1, 24-96, and DSD64, played them via the D10 and didn't observe any clicks in the transitions.